Expekt is a modern gambling company from 1999 with headquarters in Gibraltar. It shows that they are working with the latest technology because everything works bug-free and user-friendliness is very good. They dont offer a Expekt bonus on signup which is a bit strange but Most markets are offered and their statistics page is a good source of information before placing bets. You can place your bets via App, Mobile Page or Computer. 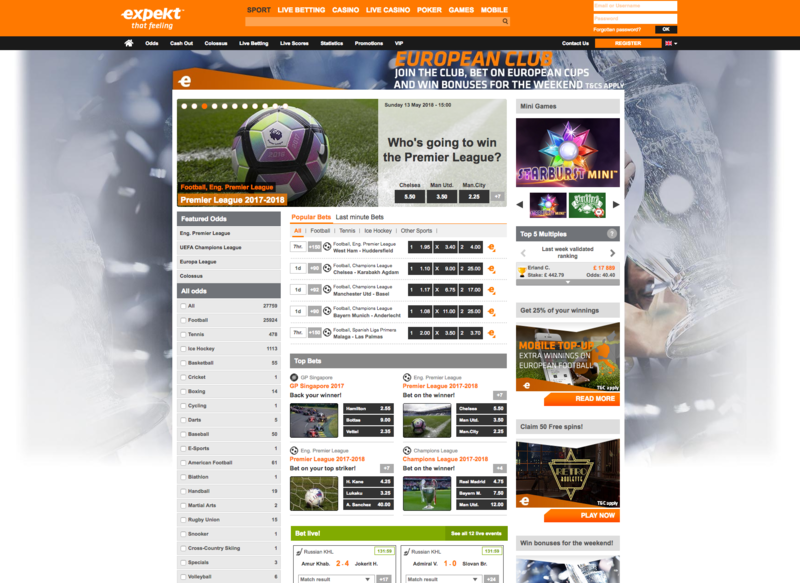 Expekt is a bookie that has everything for you as a player, whether you are a beginner or a professional. What about the possibility of combining home the biggest jackpot in sports around the world? Colossus as it’s called pays up to £ 5 000 000! Simply explained, it is a matter of placing accumulators on match results, which in turn takes you to the jackpot. There is a detailed description of how the game works on Expekt’s website. Expekt is committed to providing live streaming to its customers. This will happen in the near future. Unfortunately, no sign up Expekt bonus for English customers but they really spoils you with other types of bonuses. You will receive money back up to €10 on your first bet via mobile if this will fail. Expekt often runs campaigns for special events or matches. It may be that you get a Expekt bonus if you are playing a particular event or that you get better odds on some matches. Expekt also offers the opportunity to get VIP status. It all depends on how loyal you are and how much you play. If you reach the VIP status, a world of benefits and bonuses opens. You will be awarded a personal contact, receive gifts, be invited to exclusive challenges and competitions with bigger prize pools and even be invited attend VIP events all over Europe. For example tickets for the Champions League finals or a luxurious weekend in the sun. Expekt, in other words, takes care of their players in a fantastic way. In-play betting at Expekt has everything you could wish for. Very easy-to-understand client with Cash Out function and with comprehensive statistics both around the current match but also tables, players, game schedule, etc. The range is big and the odds are good. What is missing in the client is the ability to stream matches. This will be offered in the near future.